This is it, the last strip of the season. The total running time of all 18 strips comes out to about 20 minutes. I'm very happy with how Season 1 turned out. 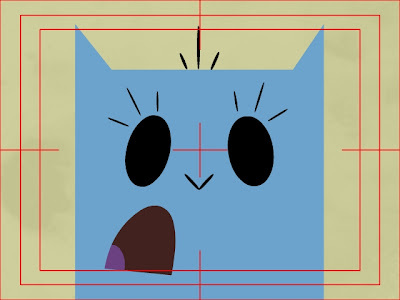 I began Prophet Buddy in June with the concept, the animation production began in July and I finished the last strip the first week of December, so it took me about 6 months to complete. I would like to thank everyone for watching! Also I would like to thank Jasminsaurus for her stories and myspace management (also for putting up with my sleep-deprived tirades), Aaron and CHF for all of the posts and making the online store, Logan and Born Upon the Tide for the shirt hook ups, Greg Araya for making the screen, Shawn for putting together the site, Chris Staples, Bob Harper, and Leo Riley for their strips, Jeaux and ChannelFrederator, the myspace buddies, and most importantly Matt Danner and Eric Bauza for giving up their free nights to make the characters real. I have more plans for Prophet Buddy. I'm going to begin production on Season 2 within the month. My month-long hiatus was nice, but my nights have become a bit boring without the buddies. 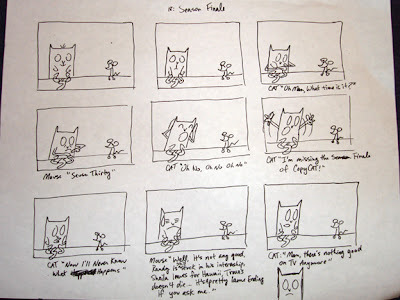 In this strip I wanted to make it anti-climatic since it was the Season Finale, which most television series' season finales have become... anti-climatic. This was my moment to put a little commentary in the strip expressing that there IS nothing good on TV anymore. In my opinion, TV is in a really bad state, I can't even watch it anymore. Mostly I watch dvds, and internet content because I can't stand the regurgitated reality shows, horrible sit-coms, and neverending marathons of poop. This is what prompted me to start Prophet Buddy in the first place. Working at a major animation studio/network, it is really disheartning watching my talented collegues, with amazing television show ideas, pitch only to get shot down one after the other. Nobody knows what they want, so they'll tell you that they love your idea. A few months later, they'll say that even though they love it, they have to develop it into something completely different to compete with Spongebob or whatever. So you rework it for a few years till you get it to what they think they want. By that time Spongebob isn't popular anymore, so they'll scrap your show or they will make you rework it again (this usually will take another year). Then if you are lucky you will get to make a pilot. After the pilot is complete, with numerous revisions, they will start testing the pilot with audiences. They will tell you that it tested better than anything they've ever tested before, so you think the series is a go. A few months later your friend will send you an instant message telling you that he is sorry to hear that your show isn't going to be picked up. You are usually the last to hear the bad news. 2-4 years has been wasted, your property is shelved and you return to your cubicle with your tail between your legs. And during all this time you are dealing with a lawyer or an agent trying to get a somewhat decent paycheck out of the deal. In the end, they'll pick up a show about some popular band from 20 years ago, like Duran Duran. And the public never sees your pilot. So yeah... I thought I'd be better off going ahead and making Prophet Buddy without a studio's involvement, and what takes a studio development department 4 years to do, I did in 6 months with no hassels. Though, Prophet Buddy really wouldn't work for TV and isn't developed at all, someone is still watching it, and that's all I want. If we have the ability to make something and get it out there for everyone to see, what's the point of going through a network? That's all for my rant, sorry about that. Thanks everyone for watching, now it's your turn to give me something to watch! HAPPY NEW YEAR!!! I hope everyone had a good one, the buddies and I sure did! That's why we're so late with this post and didn't follow up to the Happy Holiday post like I said we do. With the New Year Special, I let Eric and Matt ad lib most of their lines. I told Matt to say 'No' every way he could, and told Eric to make up a bunch of resolutions. Technically I should have given them writing credits too, but I dunno, I guess I'm an attention hog. I dunno if anyone has noticed, but I'm very influenced by comedians of the early years of film. Especially The Marx Bros. and Charlie Chaplin; Harpo and Chaplin, I find are great references for expressions and movement. By the way, the line, "I want excitement, I wanna Ah cha cha cha" that the Cat says in the 'Told You So' strip was taken from Groucho Marx in the movie 'Monkey Business'. In the New Year Special, I referenced W.C. Fields and the hat take that he often does. The Cat doesn't normally wear a hat, so I took this opportunity to throw it in there for good measure. Be sure to watch next week, it's the SEASON FINALE!! !